Well, after much debate I decided to cheat a little this week and not make a lactose free version of the recipe of the week...shhh, don't tell the kids!!! My freezer does not appear to be level so my layers are a little confused. I decided to treat my husband to a chocolate mint version but I have no measurements of what I did...a little mint extract and a little peppermint schnapps made him a very happy man! This is only to be eaten after 8pm as the kids seem to have forgotten me making it...out of sight out of mind still works around here...although they are wondering what happened to the rest of the granola grabbers! Hope everyone else enjoyed this easy recipe as much as we did...it was just so simple! As long as you weren't going far it is all good! 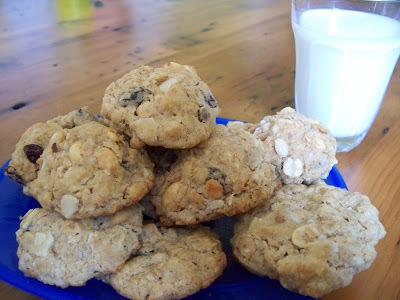 Until next week when the kids return with Chunky Peanut Butter and Oatmeal Chocolate Chipsters! 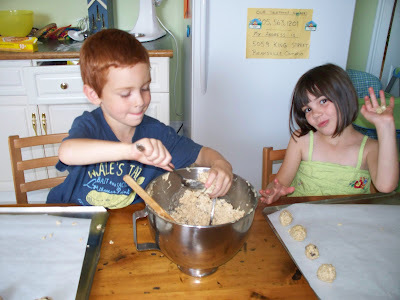 We got all the ingredients mixed up and ready to go when Simon called...so the kids took a quick run in the yard while I fed Simon and we reconvened to scoop the cookies out and get them in the oven. This was a perfect job for the kids...Granola Grabbers as chosen by Michelle of Bad Girl Baking are messy!!! But won big on the fun factor with both the kids! The panel of judges gave this recipe 4 thumbs up! The Birthday Bonanza Grand Finale! 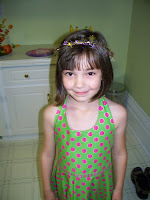 The signs of the end of the summer are here...we celebrated our last birthday of the summer in the house on the weekend, the evenings are getting shorter, and school is just weeks away. So hard to believe!!! 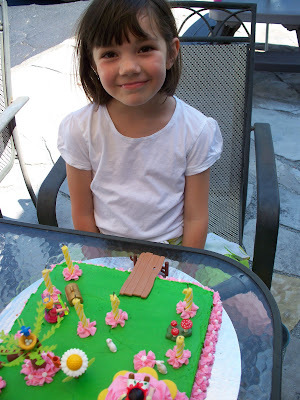 To celebrate Sarah's 6th Birthday I needed a simple cake as the celebration was just days after our return from vacation. I baked the cake and cupcakes in advance (in the midst of baking all of my other cakes!) and froze them. Here is our Sweet Six Year Old very excited about her newest delight! 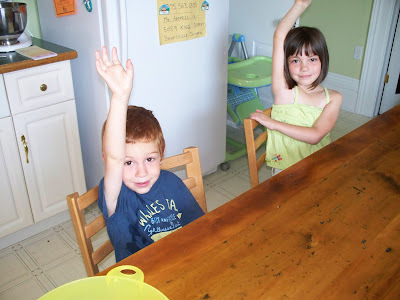 It's hard to believe that they aren't tired of cake yet...of course they are children aren't they??? This was a single layer yellow cake frosted with buttercream icing (how much easier does it get?) The cupcakes were baked in Wilton Silicone Cupcake Holders that have flower petals (so sweet!) 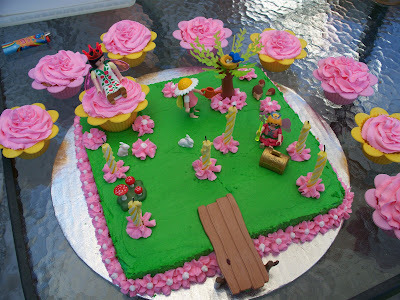 The cake is then decorated with Playmobile Toys from the Fairy collection (part of Sarah's birthday present). I also added some flowers to decorate the cake and cover up a few little oopsies that happened along the way! This was Sarah's favourite cake of the 6 that we have had over the last 4 weeks (unbelievable!) We baked up some cookies this morning for Tuesdays with Dorie so come back to hear about that tomorrow! 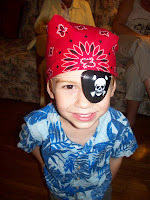 Arrg Matey TWD with Dorie, Princesses and Pirates! Well, this week's Tuesday with Dorie recipe was chosen by Dolores of Chronicles in Culinary Curiosity and was Blueberry Sour Cream Ice Cream. While this sounds quite lovely...I was challenged on several fronts. Not having any time to speak of with our annual birthday party for Sarah & Sean, no lactose free sour cream and no ice cream maker. So, this week they offered an alternative to do a past recipe. Be sure to check out the lovely Ice Cream some of my fellow Dorie fans created in the meantime here is my treat of the week! Since it was birthday time here I chose to make Bill's Big Carrot Cake from April 22 chosen by Amanda of slow like honey. 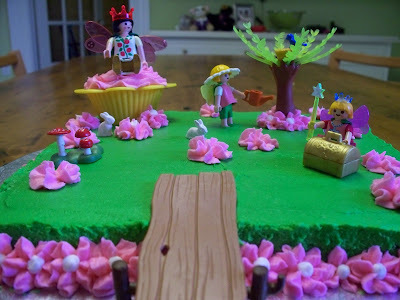 I used this to create the Princess Cake for our Pirates and Princess Party. Everyone loved the cake and especially enjoyed the coconut in the batter. 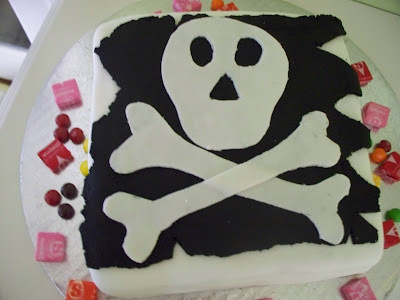 Here it is... Now the pirates needed a cake as well...so here we have it! A chocolate cake all done up in fondant. Now, I am particularly proud of this one as it is the first time I have ever managed to the corners right on a square cake when applying fondant!!! I actually took angled pictures of the cake just to show that but I will spare you the agony today! Now where are the Pirate and the Princess you ask? Here they are...you can barely see the tiera on Sarah but I made tieras with garland and ribbon for all the girls to wear. They were easy to make and super sweet! 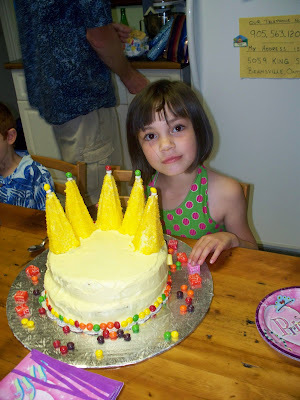 Here is our princess with Bill's Carrot Cake! 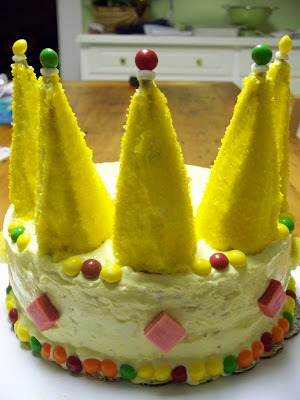 She was quite delighted with her crown cake. I did follow the recipe I just changed the colour of the icing and decorated it up! It was nice to make something that I needed this week...it really took a load off as we are heading on vacation...actually we are already on vacation as I created this post on Sunday and set it to post on Tuesday. There is packing to be done and party pick-up too! 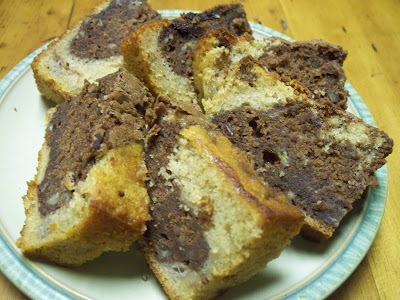 Thank you to Ashlee of A Year In The Kitchen who chose Dorie's Black and White Banana Loaf this week! It was nice to have a bit of a break...with all the cakes I have on order and Simon things are a little hairy over here! On to the loaf...my Pyrex loaf pans are otherwise occupied so I broke out my silicone one. I was having trouble following directions so the black and white parts are not evenly distributed throughout my loaf. Oops! We added nuts to the chocolate part (it was a big decision...which part to add them to!) 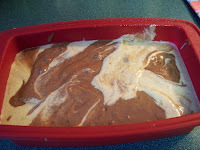 I was a little disappointed in the silicone as it seemed to bow once the batter was in it...so my loaf was very wide. It seems that story time for our 2 older children was in the middle of baking time and I lost track of the loaf so when I went back downstairs and checked it the timer was off (for who knows how long) and when I stuck a toothpick in it, it appeared to be done. Well, maybe not quite. If you look closely you can see some pretty dense parts on the loaf. Oops again! 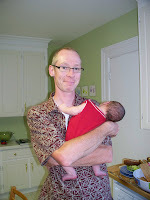 The loaf is quite enjoyable but it took me quite awhile to make it...we even had to stop for dinner in the middle of the process...babies are not babies forever so I am going to have to learn to take things a little slower I guess!